Goalkeepers - a different breed. This goes for custodians and their wont of individuality in the attire they take to the field. 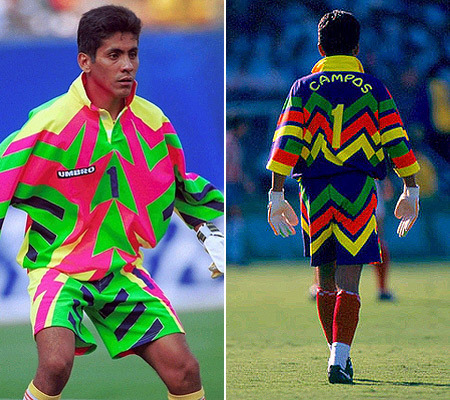 We all will reference Jorge Campos' day-glo oversized kits of the mid-nineties and Fabien Barthez, the wannabe outfielder, bringing short-sleeved goalkeeper shirts to the Premier League - despite Peter Schmeichel having already eschewed forearm coverage for the same club previously - but the evolution has taken several twists and turns over the last few years. If we travel back half a century, goalkeeper shirts were generally functional and seldom evoked the personality of the footballer inside. The colour distinguished the player from his outfield teammates, like the blue blood rather than the subjects' red running through the veins of the British royal family, in order to indicate that this person lived by a different set of rules. Shorts and socks could match the rest of the team, as below the waist a goalkeeper was akin to anyone else, but when the sleeves came into play these needed to be easily noticeable as legally handling in the box. Lev Yashin wore a black shirt, for the USSR, which became iconic through the wearer's exploits, and Peter Shilton added a stitched number 1 to his green shirt - inspiring Brian Clough's legendary green jumper as he was the "one number 1 around here" - at a time when any further identification had generally been deemed unnecessary. Aside from this there was a landscape of green - and yellow internationally - with few exceptions. Contrast this with the spectacular - often horrendous - designs of the nineties. The no-holds-barred assaults on the eyes of opposing strikers gave us some of the most gaudy designs we've ever seen on a football pitch. 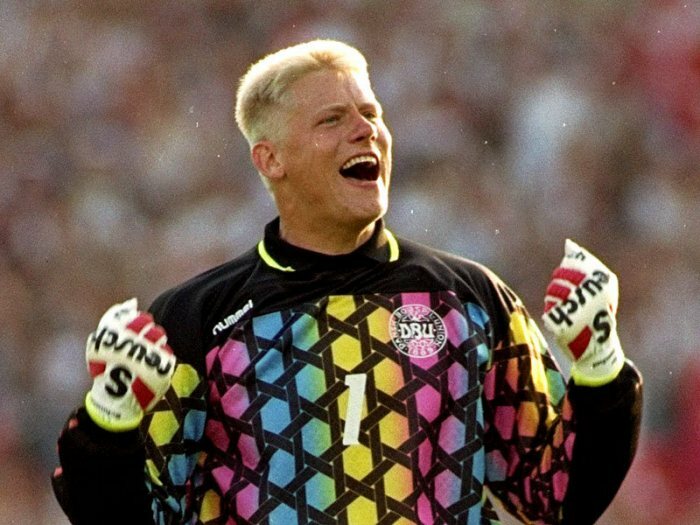 Schmeichel modelled plenty of shocking styles with great success for Manchester United and Denmark. The other option was to kit out goalkeepers in a design derived - with extra padding - from the strip his teammates would be wearing outfield. Both approaches continued into the last decade, evolving - perhaps denoting the increasing football ability of goalkeepers instigated by the backpass rule of 1992 - into 'keepers wearing shirts and kits bearing the hallmarks of intended outfield kits. 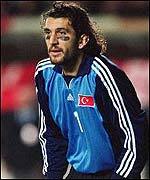 Padding seemed to be phased out and the goalkeeper shirt was often provided by a change shirt not that day in use. Outfield teamwear also featured. One of the most famous goalkeeper shirts of all time is now Iker Casillas' black and yellow number worn when lifting the Henri Delaunary trophy in 2008. Rather than being a bespoke goalkeeper shirt - like Luis Arconada's worn by Casillas' deputy Andrés Palop when celebrating that triumph - it was a year old adidas Golpe outfield teamwear template. Euro 2008 came at the end of a season when Olympique de Marseille's Steve Mandanda had worn the Golpe design, as well as following Gianluigi Buffon's lead by turning out in an alternative kit from the outfield wardrobe, and the favour was even returned by his teammates wearing the shorts and socks of an intended goalkeeper kit to avoid a clash against Strasbourg. 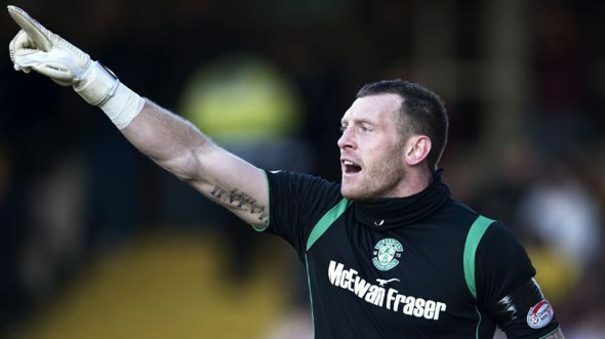 Confirming beyond all doubt that there was little, if anything, to differentiate outfield kits from goalkeeper kits in terms of functionality, in 2009-10 Hibernian announced a few weeks into the season that their all black goalkeeper kit would be doubling up as a Third kit, and was consequently marketed and sold as such. It's an idea that should be embraced - as I have predicted and implored - by England and Umbro, with the enormously popular all red goalkeeper kit. England already missed the opportunity to wear the recent yellow and white goalkeeper kit outfield - which would have worked as a clever nod to meetings with Czechoslovakia, Poland and Italy in 1973 - and, before Nike take over, the red England kit deserves to take up its rightful place on the pitch. Umbro do England goalkeeper kits well - as the Away and Home change attest too - but the people have spoken (not convinced? Apply a ctrl F search for "away" to this page). However, goalkeeper kits now appear to be regressing to the identifiably functional and specific creations of yore. They may still contain the moisture-wicking and temperature regulating technology of their outfield counterparts but they are now often unmistakenably made to be worn by the last line of defence. One current fashion, from both adidas and Nike, seems to be designing goalkeeper shirts with lower arms a different colour to the upper - with the potential to confound referees already struggling to enforce rules on baselayers when short sleeves are employed. 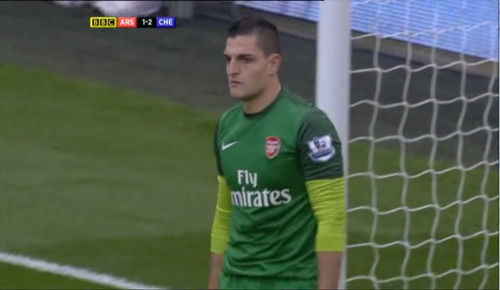 So goalkeepers have their own style back. Padding seems to be experiencing a resurgence, Uhlsport gloves have bright red fronts - risking the overused "he caught it red handed" pun - and, as the winner of a recent DF competition foretells, the louder patterns of the nineties may be commonplace again soon. It will be sad to see the end of derivative styles such as the red France marinière goalkeeper shirt - based on the Away shirt of the time - but the characters which follow the lineage of individualists like warpaint-wearing Rüştü Reçber and Spider-man-masked Jérémie Janot will stand out like their personalities scream that they should.